The Rolling Stones have been officially confirmed to play the 12.12.12 Hurricane Sandy Benefit Concert at Madison Square Garden in New York City. The addition of The Stones has been rumored for some time now but has finally come to fruition. It seemed only perfect, since The Stones are playing the Izod Center in Jersey City, NJ the very next day as part of their 50th anniversary kick-off. 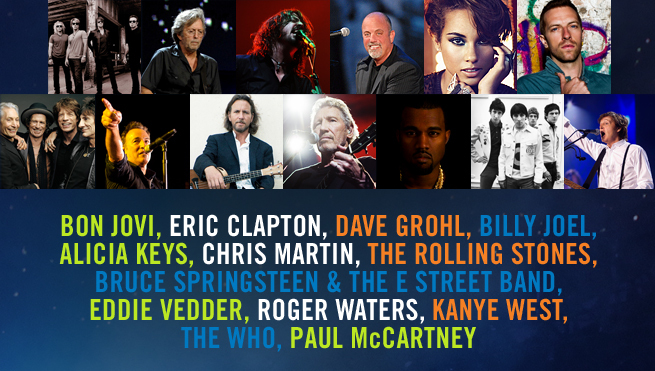 The already stacked bill includes The Who, Bruce Springsteen & The E-Street Band, Billy Joel, Paul McCartney (The Beatles), Eric Clapton, Roger Waters (Pink Floyd), Bon Jovi, Dave Grohl (Foo Fighters), Eddie Vedder (Pearl Jam), Chris Martin (Coldplay), and more. The concert is being organized by the same collective group that set up the Concert for New York City after September 11th: John Sykes, President of Clear Channel Entertainment Enterprises; Harvey Weinstein, co-chairman of the Weinstein Company and James Dolan, Executive Chairman of the Madison Square Garden Company. Tagged 12.12.12 Hurricane Sandy Benefit Concert, Billy Joel, Bruce Springsteen, Jon Bon Jovi, Paul McCartney, Roger Waters, The Rolling Stones, The Who.